Red River Palo Duro Soft Gloss Rag is widely believed to be the same paper formulation as Canson Infinity Platine Fiber Rag and also Epson Legacy Platine. Moab Entrada Rag Natural is a very nice fine art matte paper similar to Hahnemuhle Photo Rag, but it has no OBAs and is printable on both sides (even the roll version!). We hope to begin testing additional media in 2017. These print samples have also been paired on the same light fade testing unit for a direct side-by-side comparison with some of the same media printed on a Canon Pro-1 and also on an Epson SC P600 as well. 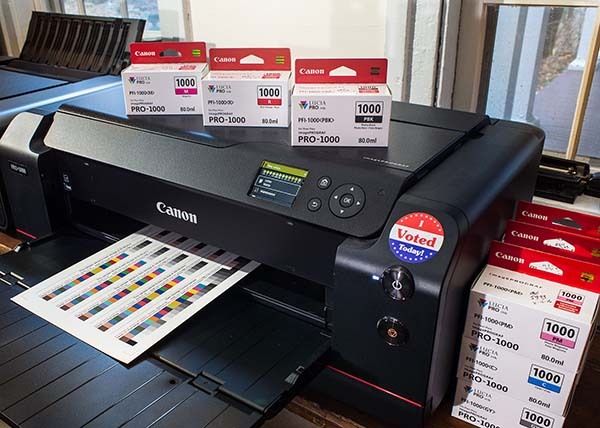 The P600 uses Epson’s latest Ultrachrome HD ink set, so we should discover how Canon’s latest ink formulation compares in light fade resistance to both Epson’s new HD ink set and Canon’s older OEM PGI-29 ink set used in the 13 inch Canon Pro-1 printer model. The 10 megalux hour test results are due to be measured in early February, 2017, but we also anticipate it will take until mid summer 2017 before trends begin to emerge in the 30+ megalux hour exposure data. By the end of 2017, the 60 megalux hour results should give us a pretty clear idea of the comparative stability of Canon’s versus Epson’s latest pigmented ink sets. In late 2015, Canon introduced the imagePROGRAF Pro-1000, and in 2016 followed up with the 24″ Pro-2000, and 44″ Pro-4000. All three models incorporate a “new and improved” LUCIA PRO-11 pigmented ink set. Claimed by Canon to outperform the Canon 13” PIXMA Pro-1 on print quality, the Pro-1000 also marks Canon’s long awaited update in the 17 inch printer category. The Pro-1000 now utilizes a fourth generation LUCIA pigment ink set and no doubt exhibits superior image quality. In a somewhat perplexing development, Canon appears to have withdrawn what were very conservative claims on lightfastness for this new LUCIA Pro-11 ink set, originally listed in the online product specifications. Therefore, we are testing this new ink set in some head-to-head light fade tests with Epson’s latest HD ink set on the same media (please see the NEW INKS AND MEDIA FOR 2016 project). 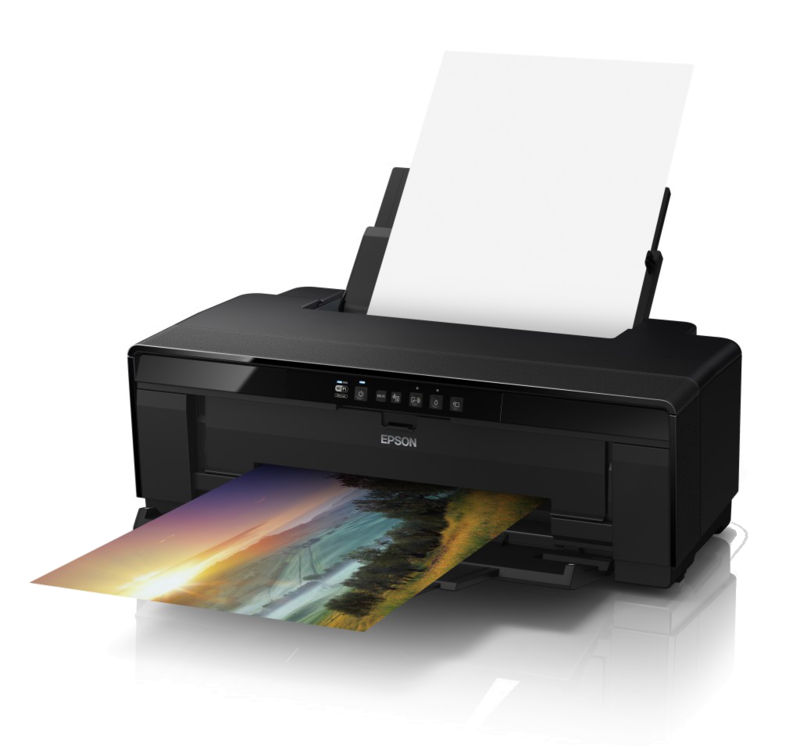 Epson recently announced a new A3+ size printer called the SC P400. It began arriving in the US marketplace in the fall of 12015. The P400 uses somewhat higher capacity cartridges of the ”UltraChrome Hi-Gloss 2″ pigmented ink set (HG2) that was originally introduced in the R1900 model followed by the R2000 and now the new SC P400. We recently allocated funds from the Aardenburg general fund to the “New Printers for 2016” campaign, and now have a new Epson SC P400 model in house. We have started to produce print samples for upcoming lightfastness tests for the Epson SC P400. Total cost of ownership will also be evaluated in our ongoing studies as more prints are produced on the Epson SC P400 printer. In regards to Canon’s lightfastness claims for the LUCIA PRO pigment inks – originally included in the online product specs, then mysteriously removed – they have reappeared in the official Canon Knowledge Base. Same identical specs published before: 45 to 60 years lightfastness on Canon Photo Paper Pro Luster and Platinum papers. Of course there is no information on the test criteria, endpoints, etc. Since Canon merged their camera and printer marketing divisions last May, this might account for some of the company’s more puzzling moves in regards to the new printer line.